Were you once a kid who ripped apart their unwanted toys, wished awful things on your sister's toys or simply imagined their toys were something else ...? In this single player or 4 person co-op first person shooter you'll get to tackle some of the weirdest creatures and get to fire some of the craziest weapons. 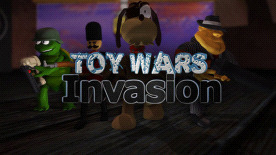 In Toy Wars you get to play as a toy as you are tasked with stopping the advance of the rebel toy army by destroying their bases ... the Toy Box. The enemy Toy Boxes are well fortified and protected, be prepared for battle as waves of defenders are sent out to stop you. With enemy toys who have pirate cannons as heads, dancing ballerinas who kill you with their legs, wizards who make killer clouds, giant teddy bears who kill with one swipe and punks that eat you to death be prepared for anything. Aside from our standard semi automatic rifle, sniper rifle and pistol we also have a collection of unusual weapons which would only exist in a kids toy box. There's the Party Popper Shotgun that fires party poppers and streamers pellets, staple gun and automatic disk launcher that fires killer frisbee disks. The game will ship with 7 maps all scaled as per real life. Therefore when playing as a toy everyday objects will appear huge. We think that the best way to bring out people's imagination and creativity is to supply them with the tools to do this. Therefore we intend to release an SDK, so be prepared to find out what lies hidden in others imaginations.